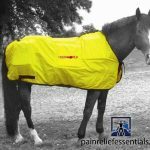 At Pain Relief Essentials we carry the premier equine therapy systems so that you are assured you are getting the best possible product for your horse. 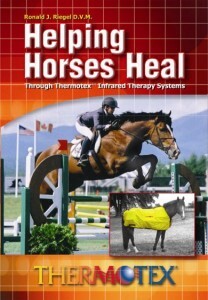 Much of the following is from “Helping Horses Heal” by Ronald J. Riegel, D.V.M., – a 111 page book that is included in your order with our complements when you purchase of the Thermotex Infrared Blanket from Pain Relief Essentials. 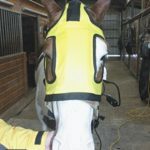 What are the benefits of Infrared Heat Therapy for your horse? 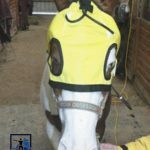 Benefits of infrared heat therapy for horses is that the Infrared therapeutic heat provides a deep and penetrating form of thermal energy. This increase in thermal energy within the tissues results in an increase in the metabolic processes within the cells. 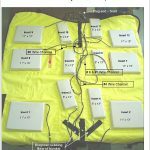 As a result there is an increase int he blood flow to the area, a decrease in pain, and a decrease in stiffness and an increase in tissue extensibility. The increase in metabolic activity within the cells results in an increased demand for oxygen and a resultant vasodilatation or increased blood flow to the area. This increase in blood flow is usually six times that of the blood flow to the same anatomical area during resting conditions. This increase in circulation not only brings more oxygen to the area but also supplies the area with more nutrients and provides a means to remove the cellular waste products created during repair. Application of infrared heat also has an analgesic effect upon the tissues. Infrared heat provides a sedative effect upon the sensory nerve endings. This ultimately leads to a relaxation within the tissues especially the muscle tissues. As a result of the increase in circulation, the waste products of injury such as prostaglandins, brandykinin and histamine are removed at an increased rate and are not allowed to stay in the area creating nerve fiber sensitization and pain. The application of heat results in an over-stimulation of the nervous tissue in that there is an increased ability for the nerve to receive and transmit impulses. This over-stimulation interferes with the nerve fibers’ ability to perceive pain therefore resulting in a state of analgesia. An increase in the blood flow and by increasing the temperature within, muscle tissue elasticity is enhanced. Muscles become relaxed and are not in a state of spasm. 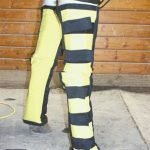 This permits them to elongate further and more efficiently when placed under exercise load. When heat is applied to tendons and ligaments, they become more elastic and flexible, providing some prevention to strains and sprains while exercising. 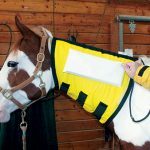 The 12 pad horse blanket is the highest rated pre and post race blanket available, and pairs perfectly with the Thermotex leggings, neck, hood, and TMJ hood therapy products.